GLP German Light Products GmbH, a leading manufacturer of innovative automated lighting fixtures in the entertainment industry, is proud to appoint Guangzhou Ruisheng Lighting & Audio Equipment Co. Ltd. as their exclusive distributor for China, Taiwan and Macao. 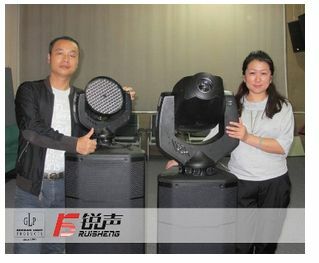 Ruisheng has offices in Beijing, Shanghai, Guangzhou and Chengdu and with nearly 70 employees has set course for be¬coming the most prominent supplier of international professional lighting and audio systems in China. The innovative product range from GLP, which includes the Impression Spot One and Wash One and the new Impression X4 add to their rich, quality oriented portfolio. Michael Münz, General Manager of GLPs Asia Office in Hong Kong, said “Since we started GLP Asia 2 years ago we have really been able to grow our business all across Asia. Our products are now used on stage with some of the most famous artists in the Peak Tower, right here in Hong Kong”. Munz will work closely with the staff at Ruisheng to ensure the highest level of customer service and support, adding “Together with Ruisheng, I look forward to building the GLP brand to great success“. Will Chen, President and CEO of Ruisheng added “This is a great step for our company. Our partnership with GLP will allow us to introduce innovative and top of the line products into one of the world‘s most advancing markets“.